Parliament is constantly in the news and televised daily, but much of its work remains a mystery to outsiders and is sometimes perplexing even to its own members. Written by expert insiders, How Parliament Works is a straightforward and readable analysis of one of the country's most complex - and often misunderstood - institutions. Covering every aspect of the work, membership and structures of both Houses, this key text provides a unique insight into the work and daily life of Parliament. It explains not only what happens but why and analyses the institution's strengths and weaknesses, as well as opportunities for Parliament to be more effective. Updates on the arrangements for the internal management of both Houses, reflecting governance reviews, with all statistics and examples fully updated throughout. 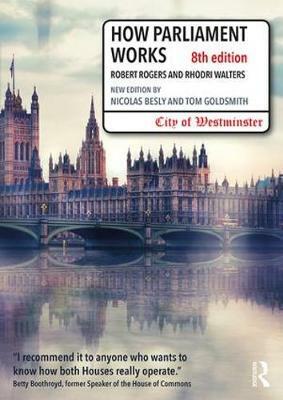 How Parliament Works is essential reading for anyone who has anything to do with the Westminster Parliament: journalists, civil servants, lawyers, lobbyists, business and trade associations, diplomats, overseas parliaments and international bodies - and indeed members of both Houses. How Parliament Works is also an invaluable companion to the study of politics at AS, A2 and university level, and provides a wealth of source material for teachers. Nicolas Besly became a clerk in the House of Lords in 2002. He has worked in the Committee Office, Public Bill Office, Table Office and Journal Office. He became the first private secretary to a Lord Speaker and edited The Table, a journal on Commonwealth parliaments. He is currently a Clerk of Select Committees, overseeing five permanent Lords committees. Tom Goldsmith became a clerk in the House of Commons in 1996. He has worked in the Public Bill Office, the Table Office and the Overseas Office. He headed the Governance Office and has served as Secretary to the House of Commons Commission. He has worked for a number of select committees and is currently the Clerk of the Foreign Affairs Committee. Robert Rogers (now Lord Lisvane) and Rhodri Walters retired from the service of the House of Commons and the House of Lords respectively, in 2014. Their careers covered every aspect of the work of both Houses and between them they amassed more than 80 years' experience of Parliament.